It starts in a swamp, and ends on a beach. It has no mountains, but it is the most botanically diverse trail in the United States. The Florida Trail stretches 1,400 miles across two time zones in a single state. In 1966, a small group of trailblazers started painting blazes in several Florida locations to provide Floridians with a place to go backpacking. Fifty years later, the statewide Florida Trail, a ribbon of federally-protected footpath between the Big Cypress Swamp and Pensacola Beach, provides day hikers and backpackers access to an extraordinary array of Florida habitats, primitive campsites, and unique natural destinations across Florida’s public lands. This commemorative retrospective of the history of the Florida National Scenic Trail shares the stories of those who have played a part in building, maintaining, and experiencing this national treasure, and recounts the paralleling history of the volunteer organization created to develop the trail, the Florida Trail Association. It is a showy 9×12″ coffee table book with 228 pages in full color. 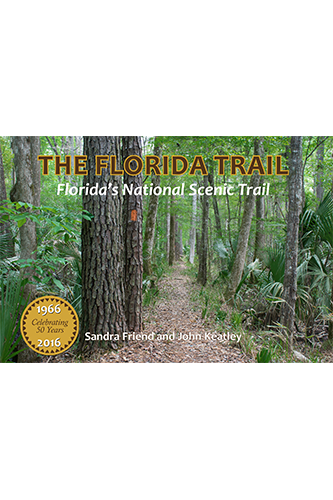 It includes 725 color images and 79 black and white images, drawing on both our personal photography of the Florida Trail over the past twenty years and historic archival images from a variety of sources, including the Florida Trail Association. It was printed in United States. A very hefty limited edition hardcover of 250 copies, signed by the authors and numbered; less than half remain. A less expensive softcover version ideal for gifts or for your library of trail books.